Arigna Natural Gardens » Welcome 2011. Got back from Tipperary last night after having a few days with the folks. We like to spend the entry to the New Year in our own place. Don’t go in for the Auld Lang Syne down the pub, actually it’s one of my least fave songs. 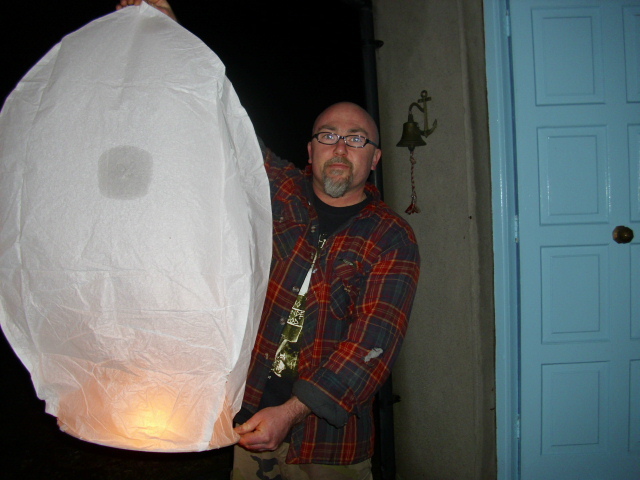 On Thursday evening all the family let off Sky Lanterns to welcome in the New Year and say goodbye to the old one. A bit early but I was leavin next day. 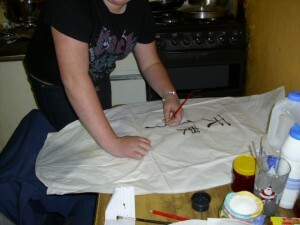 We painted each one with Japenese symbols which my niece Bridget had researched. She is mad into everything Japanese. 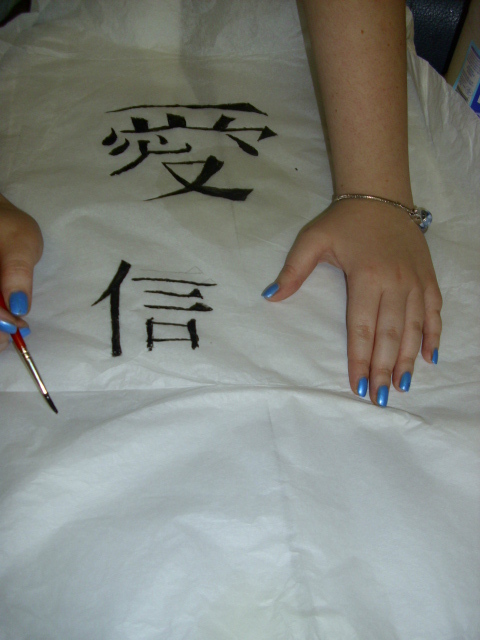 Japenese symbols for Love and Light. 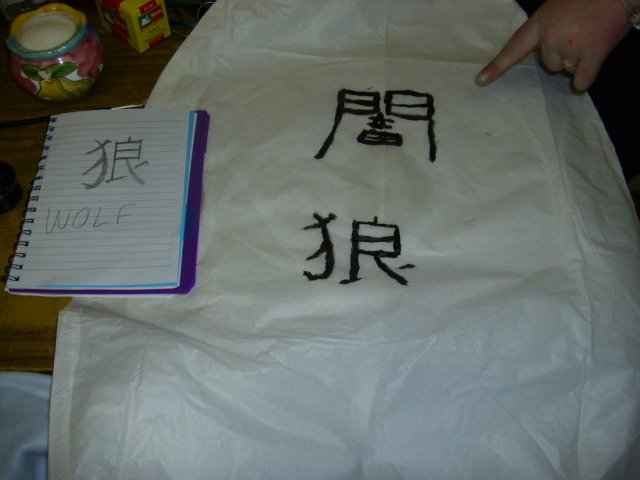 I really liked the ceremony of letting of the lanterns, the kids did too. 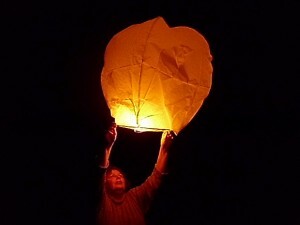 Each of us made a secret wish as our lantern was released. Researching and painting the symbols was a great activity. Sky Lanterns are very eco-friendly as they are made from bamboo and paper. It is a much gentler and less disruptive activity than letting off fireworks. They are also considered good luck for the coming year and symbolise your problems and worries floating away. In this age of children spending endless hours on computers and WII’s I think it is important to do some activities which get them involved in alternatives. Remember that their adult memories of their childhoods are being created now. I know this is a good memory created for all in our family for this coming of 2011. We both released lanterns at midnight last night here in Arigna. May it bring you Love, Light, Truth and Hope. 5 comments to Welcome 2011. Happy Now Year Briget and Andy. Sorry that should have read Happy NEW year. How can I sign up for a a copy of your blog?? Just add us to your favourites list. I’m afraid I don’t have a mailing list, am not that computer literate yet. Happy New Year to you both. Happy New Year to you both. Loving the blog. If is very impressive. Andy, loving the distinguished looking goatee. Grate Ex has gone bust back in Bristol. End of an era. Spoke to Nick about the old stock but he wouldn’t do any deals. Anyway, speak soon and keep in touch. shame about Grate Expectations. Brings back good memories, the fun we had!. No decent songs on the radio anymore, so the van singalong would have died a long time ago!. Hopin your business is going ok. If you need any help then let me know. No jobs to be had in Ireland!. Look after yourselves. May get to see you all this year.